The most northerly cru, Saint-Amour lies directly south of the Mâconnais AOPs Pouilly-Fuissé and St- Veran (which actually overlaps it). While not as old as several of its more historic cousins, it is nevertheless an appellation of long-standing, established after WWII, in 1946. It currently spans some 320ha of hilly, geologically-diverse terrain, making it the second-smallest cru by area, after Chénas. Just over a hundred growers farm here. In terms of topography and geology, two features are of note. 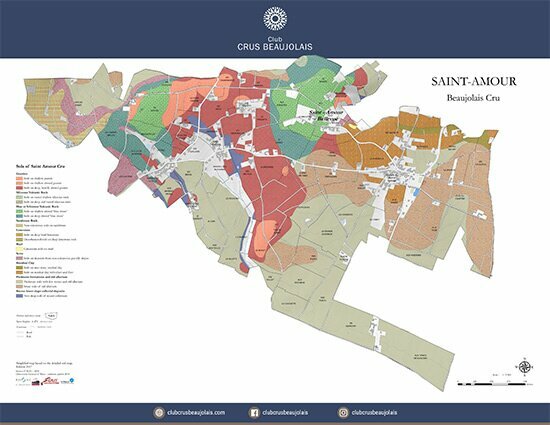 First, most of Saint-Amour’s vineyards lie on east-facing slopes, making for wines of a more moderated intensity than the more powerful crus immediately to the south. Second, the geological terrain is remarkably diverse for the region, spanning an interwoven patchwork of schist, granite, limestone and even alluvium. This diversity provides a range of possibilities for growers and winemakers, and as a result, wines from Saint-Amour run the gamut from fresh, fruity vins de soif to more minerally-intense vins de garde that benefit from a few years’ cellaring. Of course, given the broad spectrum of production, it’s challenging to characterize the wines of Saint- Amour with too fine a point. In general, however, Saint-Amour can be thought of as a mid-weight wine, with aromatics and flavors of red fruits, warm spice and, occasionally, stone fruits such as peaches and nectarines. Though they were not formally grouped under the AOP label until 1938, the vineyards of Juliénas were known even to the Romans, who were so enamored the wines grown there that they named the area’s eponymous hub and a smaller satellite, Jullié, after Julius Caesar himself (or so the story goes). Today, the region covers 600ha of vineyards spread over four primary villages: the main town, Juliénas, situated on a moderate rise just to the west of the Saone River, and Jullié, Emeringes and Pruzilly, which lie a bit further up the slopes to the west of Juliénas itself. Some 120 growers produce within the boundaries of the cru. 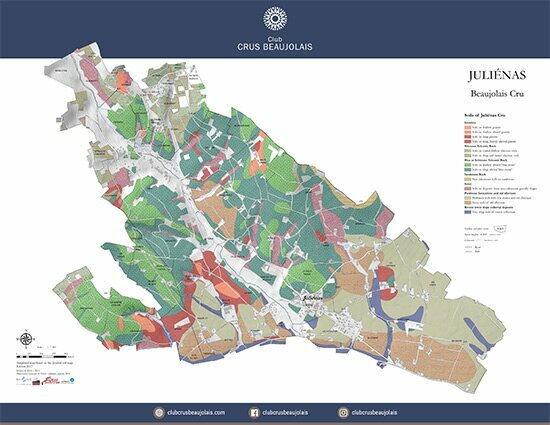 The most defining aspect of Juliénas from a terroir perspective is the shift from the igneous-dominant slopes to the west of the zone, peppered with blue granite and diorite, to the flatter areas around the town of Juliénas itself, where the soils transition through to schist and alluvium with pockets of sand and clay. Wines produced from fruit grown on the western slopes tend to possess a precise floral profile, moderate tannins and bright acidity. As one moves down the slope in the direction of the Saone, the wines become more immediately fruit- and spice-driven. Many growers elect to blend parcels from both sides of the appellation to attain an approachable middle-ground without sacrificing too much structure. Typical aromas and flavors of Juliénas include black cherries, currant, and warm spice. In general, the wines are dense, dark and weighty, though occasionally lacking the firm structure that marks some of the crus further south. 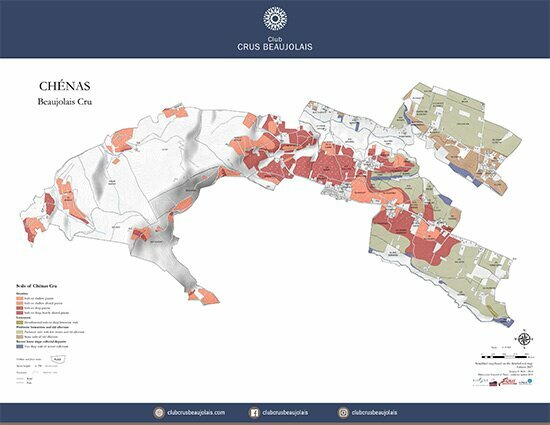 Southeast of Juliénas lies one of the most historically-lauded and rarified appellations in the zone: Chénas. At only 290ha, it is the smallest of the ten crus, and beyond its relatively meager viticultural output, it is also at the very bottom of export volumes to the United States. The appellation is situated on the east- and southeast-facing slopes of Mount Remont, and essentially forms an upside-down ‘U’ atop the larger (and equally well-regarded) commune of Moulin-à-Vent, immediately to the south. It shares with its more imposing neighbor a host of impactful terroir features, the most important of which is a preponderance of pink granite striated by deep veins of uplifted quartz. These poor, coarse-grained soils produce fruit of exceptional concentration, which underlies much of the storied power of Chénas. Indeed, its wines are among the longest-lived and most powerful of all cru Beaujolais, marked in their youth by intense floral and red/black fruit aromas—particularly violets and raspberry—that evolve into a more complex, woodsier profile with age. Texturally, wines from Chénas are typically marked by prominent yet velvety, rounded tannins, high acidity, and high complexity. And, just as in Moulin-à-Vent, the wines benefit great from medium-term cellarage. South-southeast of Chénas, on the 200-meter slopes above the town of Romanèche-Thorin, lie the vineyards of Moulin-à-Vent and the first of the famous appellations that arguably make up the heart of the cru zone. Like Juliénas, Moulin-à-Vent has only enjoyed official AOP status since the mid-1930s, but its wines were well-known even in antiquity. Today, it is a relatively large cru, spready over 600ha and counting nearly three hundred growers. It is undoubtedly the darkest, most masculine, tannic and age- worthy of all the crus, giving rise to its occasional moniker, ‘the King of Beaujolais’. Partly, this is due to the prevailing style of the region, which favors a more Burgundian-style vinification with longer, traditional macerations. Yet also equally impactful are the region’s soils, which are composed primarily of pink granite bedrock—similar to what is found in Fleurie, Régnié and Chiroubles. In Moulin-à-Vent, however, these soils are suffused with quartz veining consisting of high levels of manganese and other rare metals; there is some as-yet-unproven speculation that this aspect of the terroir here contributes to the sturdy character of the wines. The bands of manganese are also sometimes speculated to contribute to the expressive aromatic profile of the cru, which veers most often to clean flavors of dark plum and purple flowers such as violets. As the wines age, a dark, spicy, earthy character emerges behind the fruit and flowers, and over time the wines begin to take on a distinctly Pinot Noir-ish character. Indeed, this effect is so widespread and clear that the locals even have a verb for this subtle conversion: pinoter. Playing ‘Queen’ to Moulin-à-Vent’s ‘King’ is Fleurie, one of the most well-known appellations of the cru zone and the source of what are almost certainly some of the most elegant and delicate wines in the entire zone. Spanning some 822ha around the town of the same name, the Fleurie cru counts some 180 growers among its ranks, including the oldest cooperative in all of Beaujolais, La Cave des Producteurs des Grands Vins de Fleurie. All-in-all, Fleurie’s growers produce nearly six million bottles annually (in a good year), and much of it finds its way into export markets; it is one of the most familiar of all the crus to the domestic audience. 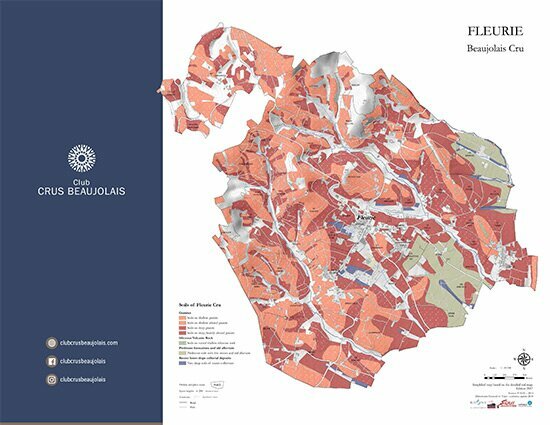 Any discussion of Fleurie must begin with the pink granite that comprises the majority of the planted terrain and marks the epicenter of a long, contiguous arc of the stuff that runs through the western slopes of Régnié, Chiroubles, Morgon and into Moulin-à-Vent. It is the defining feature of the appellation’s terroir, and its high mineral content and calc-alkaline structure contribute hugely to the aromatic expressiveness of the wines. The overwhelming first impression one gets from smelling a glass of Fleurie is flowers, particularly wildflowers and red roses. Fresh berries and cherries abound, too—bright red ones and wild black ones, brambly in the nose and bright and tart in the mouth. Texturally, the wines of Fleurie are defined by finesse: by a clean, precise acidity, by gentle, integrated tannins and by its haunting floral signature. This is particularly true near the top of the south-facing slopes, where the vines cling to topsoil-free rock. As one moves down towards the town, the wines take on a slightly more robust profile, but never lose their fresh, floral verve. Along with those of Morgon, the growers of Fleurie are among the most progressive in the cru zone in terms of defining individual climats within their holdings, and bottling them as such. This provides yet another dimension for exploration and enjoyment of the wines, and lends a seriousness to the presentation of the wines in the market. Southwest of Fleurie, the terrain rises steadily up the slopes of Chiroubles, the highest and coolest of the crus. With vineyards starting at 250m and soaring up to 450m above sea -- significantly higher than most of the rest of the cru zone -- it’s no surprise that Chiroubles is almost always the last to harvest, sometimes as much as a week or two later than its neighbors. As elsewhere, a sandy pink granite abounds here, which lends the wines some of the delicate floral characters as those of Fleurie but with generally higher acidities and a brighter mouthfeel. This delicacy is augmented further by the relatively high altitude of the vineyards and a milder climate, which allows the 60-odd growers in the commune to stake out a position as the lightest, most fragrant of the crus. On the flip side, the slopes here are as precipitous as they are picturesque: the 350ha of plantings are spread over a multitude of small parcels, virtually all of which must be worked by hand given the steep pitch. The wines are pretty, fresh and dangerously easy to drink, imbued with aromas and flavors of tart cherry, raspberry, rose petal and violet. Texturally, the wines have a breezy freshness, lip-smacking acidity and what might best be described as Beaujolais-ness. This profile of aromas, flavors and textures makes Chiroubles a great gateway to the more intense wines found in the more brooding communes, and a logical connector between the substantive cru wines and the less concentrated regional appellations of Beaujolais and Beaujolais-Villages. 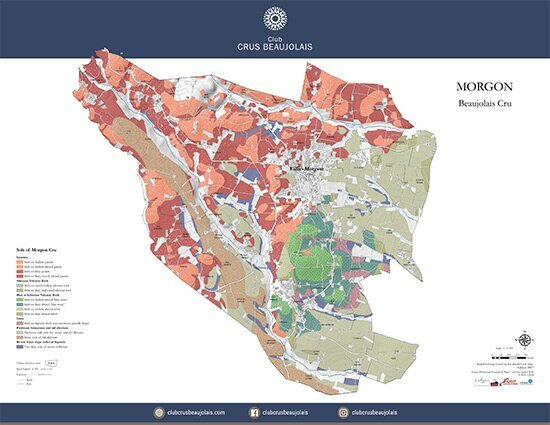 For a variety of reasons, Morgon is both literally and figuratively central to the cru Beaujolais story. It’s an expansive appellation in the context of the larger cru zone: the second largest of all the crus, at just over 1100ha. Nearly three hundred growers work within its boundaries, many of whom are exported widely. And it is probably the appellation that is mostly closely identified with cru Beaujolais in general (in the United States, at least). Indeed, Morgon’s storied ‘Gang of Five’—Thévenet, Lapierre, Foillard, Breton, Chamonard—were among the first wave of culty ‘natural’ Beaujolais to arrive on US shores, which catalyzed an early association of Morgon with cru Beaujolais in general in the minds of domestic buyers. The association has persisted to this day, although the spectrum of the appellation and the winemaking styles therein is, in reality, much broader. It also bears noting that, like Fleurie, Morgon has done a better job than the other crus at isolating specific climats and labelling wines as such. From both an educational as well as a marketing perspective, this makes the delineation of the various micro-terroirs within the zone much more easily digestible, and provides welcome clarity to the dynamic range that exists within the cru. Any conversation of this dynamic range must begin with the predominant soil types present within the appellation. In Morgon, these types can be clustered into three distinct bands, two of which are somewhat predictable given what we have already seen in the crus to the north: sheets of decomposed, sandy pink granite cascading down the slopes that arc across the northwestern side of the appellation, and more alluvial, sedimentary soils to the east as the terrain flattens and pushes towards the Saone river. The third soil type is much more unique, and is localized to the south of the town of Villié-Morgon, around the hill known as the Mont du Py. Here, the land is dominated by a pyritic Carboniferous schist in shades of green and black and blue, rich in iron and manganese, and riddled with fissures ideally-suited to the roots of the vine. This is Morgon’s famed roche pourrie (‘rotten rock’), so named because of its crumbly, fractured appearance. The Côte du Py is arguably the most famous climat in all of Beaujolais; in the right hands, it and the other schist-rich vineyards nearby can produce wines of extraordinary mineral intensity and complexity. And while it is challenging to paint a large and diverse appellation like Morgon with too broad a brush, it is precisely this mouth-filling minerality that is most closely associated with the prevailing style of the cru. Beyond that, there is cherry in abundance, along with a savory, meaty concentration. These are wines of power, intensity and weight—maybe not quite as tannic as Moulin-à-Vent, but substantial and serious in their structure. In older examples, an irresistible forest floor earthiness bubbles up to the surface, sometimes a whiff of exotic spices. And beyond it all, this defining mineral signature of smoke and struck flint and pepper spice, particularly in the wines grown on the southern band of the cru. As one might expect from such a serious expression of Gamay, the wines of Morgon are among the most age-worthy of the entire cru area. The newest of the ten crus, Régnié wasn’t awarded formal formal AOP status until 1988, after a prolonged lobbying effort on the part of the area’s 80-odd growers. Prior to that, the nearly 500ha of vineyards surrounding the two primary towns of Régnié-Durette and Lantignié languished in the Beaujolais-Villages classification. The bump-up to cru status was long overdue. In addition to possessing some fantastic old-vine plantings, Régnié had long been known for producing a unique, high-toned Beaujolais. Its vineyards are situated at nearly as high in the western hills as those of Chiroubles, and on nearly identical sandy, pink granite soils. As the southeastern-facing vineyards begin to approach the flats extending towards the river to the east, clay levels rise and the wines become correspondingly denser. In general, though, the prevailing style of the Régnié cru is one of freshness, lightness, tangy red fruits and shades of spice. In many ways, it plays a similar contrapuntal role to Morgon as Fleurie does with respect to Moulin-à-Vent: the bright, finessed yang to the intense, brooding yin of the northern neighbor. 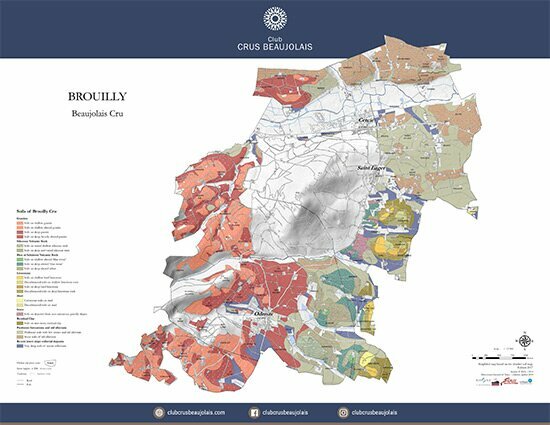 Brouilly is cru Beaujolais writ-large. At over 1300ha it is the largest cru by a significant margin; the appellation accounts for 20% of the total area of the ten crus. Over five hundred growers work in its vineyards, producing some nine million bottles that are sold throughout France and beyond. Furthermore, the viticultural history of the area is extraordinary: anecdotal evidence suggests that vines were planted on Brouilly’s slopes some two thousand years ago, and the villages of the area already had a documented presence in the Parisian market as early as 1769. These outsized dimensions, combined with its established record in wine shops and bars the world over, have closely identified Brouilly with cru Beaujolais as a whole, perhaps more closely than any other cru aside from Morgon. 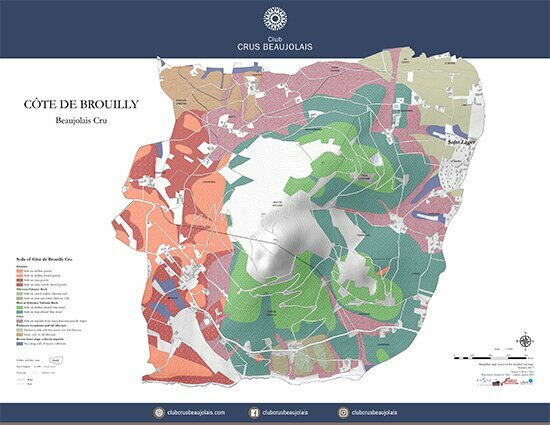 The dominant feature of the cru is the mountain from which it takes its name: Mont Brouilly, a broad, flat-topped, volcanic elevation set dramatically apart from long chain of hills that gird the western edge of the line of crus. Around this massive geological feature are drawn the boundaries of the AOP, which resemble an oblong donut in shape; the steep upper elevations constitute an entirely separate appellation, Côte de Brouilly. Six separate communes dot the Brouilly zone, and it is by grouping them that the varied soil types of the region are best understood. In Quincié, Odenas and Saint-Etienne-la-Varenne, to the west of the mountain, the thin soils are dominated by the familiar pink granite, with a good measure of sand. On the northern side, around Cercié and Saint-Lager, and again in the south, large diorite deposits combine with other volcanic stones washed down from the upper slopes of the hill. Lastly, a substantial pocket of limestone marl can be found near Charentay, to the east, along with alluvial clay soils in the direction of the river. 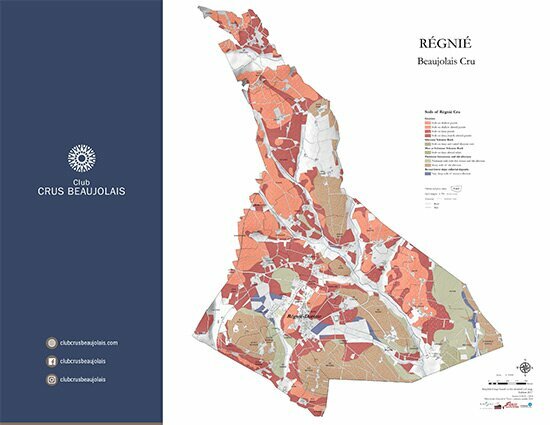 While these four soil types produce distinct styles of Beaujolais, there are common threads. The exceptions notwithstanding, the overarching Brouilly style is one of fruitiness and medium-weight approachability, with sweet black cherry notes backed with warm spices and occasional floral elements. Tannins are generally soft and round, and usually well-balanced against a gentle but present acidity. Brouilly is often positioned as the quintessential bistro wine, for obvious reasons. The Côte de Brouilly consists of a ring of vineyards, situated above 200m on Mont Brouilly and extending up to the thick crown of trees that carpet the summit. This band of vines comprises one of the smallest (300ha in total) and most unique terroirs in the entire Beaujolais region. Vines are planted on every side of the hill, with the majority on the south- and east-facing portions. Barely 50 growers work these slopes, which must be farmed manually or with minimal mechanical assistance on account of the extremely steep gradient. These precipitous inclines provide one of the two central elements that make the character of the Côte de Brouilly so unique. At up to 40 degrees in spots, the pitch allows for excellent sun penetration on all sides, which results in rapid ripening and a generally-earlier harvest than the rest of the crus, even despite the relatively high altitude of the vines. The second unique feature is the earth itself, a mostly monolithic outcropping of strikingly beautiful blue-green diorite rich in sodium and fissured with quartz veins. This special Paleozoic stone is lovingly referred to throughout the area as the pierre de Brouilly, and in addition to being used decoratively around in the houses and wineries that dot the mountain, the unique chemical composition (high in sodium, low in potassium) is thought to assist in the metabolism of the vines. Additionally, the dark color of the stones absorbs sunlight during the day and then releases its warmth at night, further speeding ripening. The sum effect of these distinctive features is a wine that is generally a notch firmer, more minerally- intense, tannic and age-worthy than those grown down the slope in Brouilly…with simultaneously more freshness and lift than the big powerhouses to the north. Aromas and flavors of Côte de Brouilly tend towards the tangy and black, often backed by purple flowers.